My summer involved working full-time through most of Toronto’s sunny days in a fairly dark office, so I decided to chase the last bit of summertime with a solo two-week roadtrip up California’s iconic Pacific Coast Highway! It’s the classic Americana coastal roadtrip that’s kind of hard to replicate in Canada. I did some quick research online and polled friends who know the coast and didn’t come up with a common tried-and-true route. What I did find is that everyone says Big Sur is incredible for it’s nature-surrounded resort experiences, but that reservations are needed months in advance. I am far too last-minute for that kind of planning, so it was going to be more on-the-fly for this one. I’d been to Carpinteria (“Carp” to locals) once before to visit friends who were filming a show in Santa Barbara but their production company rented the crew some cheap cottages in the nearby town. Carp is a totally charming surf town about 10 miles from Santa Barbara and not even a 2-hour from Santa Monica. This section of highway was populated by dozens of California state beaches, full of locals enjoying the warm early September weather. It was a good starter leg for the roadtrip because it transitioned out of the busyness of the city and offered immediate scenic views to remind me how good of an idea this was. I recommend packing a beach cooler for the drive, in case you feel the urge to pull over and spend an hour or two on one of the beaches or floating in the huge pacific waves. This is a big chunk of California to cover! 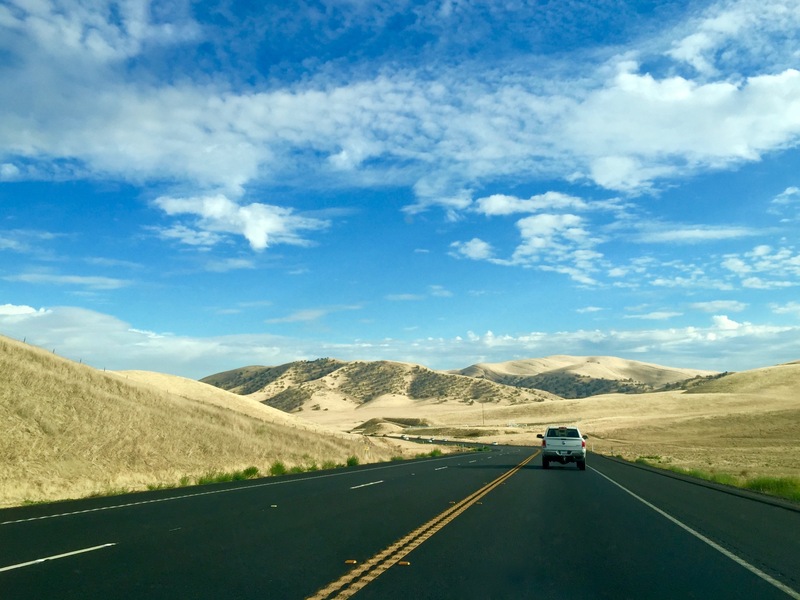 Continuing up the 101, the drive takes an inland turn for a few hours until you reach San Luis Obispo, the town where the 101 meets the 1 and the adventure heads back out to the coastline. I stopped for a stretch at San Simeon State Park and walked in the surf for a bit to wake up and cool off. I opted out of Hearst Castle despite all of the signs urging me to check it out, mainly because I knew the best part of this day would be the coastline drive at Big Sur. As I drove closer to Big Sur the entire experience changed – this is where Highway 1 hugs the cliffs over the ocean and turns into a winding series of switchbacks as the road climbs up then down the mountains. With construction in some places and simply too much traffic in others, there were several single-lane passes where things came to a standstill as all the cars navigated the narrow sections of road one direction at a time. It’s a stunning drive; I’ve never seen anything like it in my life. The narrow gravel shoulder of the road is literally the only thing between the road and the ever-increasing drop down to the Pacific ocean. Every view was a stunning portrait but the important thing for me to remember was to keep my eyes focused on the drive. No pictures from this section, just a ton of unforgettable memories. And if I REALLY need a photo of the views, I know I can find excellent photography for sale online. I wouldn’t recommend this drive at night or in bad weather. The clear sunny day was perfect and the driving time was around 6 hours that day just from Carp into Monterey. I luckily stopped for gas in Santa Maria, which is the final opportunity before the 1 turns into a purely scenic drive with no rest stops, gas stations or any sign of commercial life. Pro tip: don’t run out of gas on that winding section of highway. Walking that would be terrifying. Monterey kind of became a destination just because of the advance planning needed for a stay in Big Sur’s amazing resorts. I am really glad I ended up there though because it meant I completed the entire winding section of highway in one drive instead of having to contend with it over two days. Monterey to San Francisco was a short drive, maybe two hours, mostly on major freeway roads. On the advice of a new friend in Monterey, I stopped at Bean Hollow State Beach for a midpoint break and a (VERY) brisk dip in the ocean. This is where I realized that the change in climate between southern and northern California is most acutely felt when you dive into the water. It was a BRIEF swim. A good friend of mine from Toronto lived in LA for a couple of years and she inspired the idea of driving up the coast from LA to San Francisco from her vivid descriptions of the scenery. Her best advice though, was to enjoy the drive…once. “Trust me, do not take the PCH back; do the 5 and the 101,” just like a true Californian, route suggestions all the way. Who am I to argue with that, especially when it cut the time down to 6 hours for the entire drive. 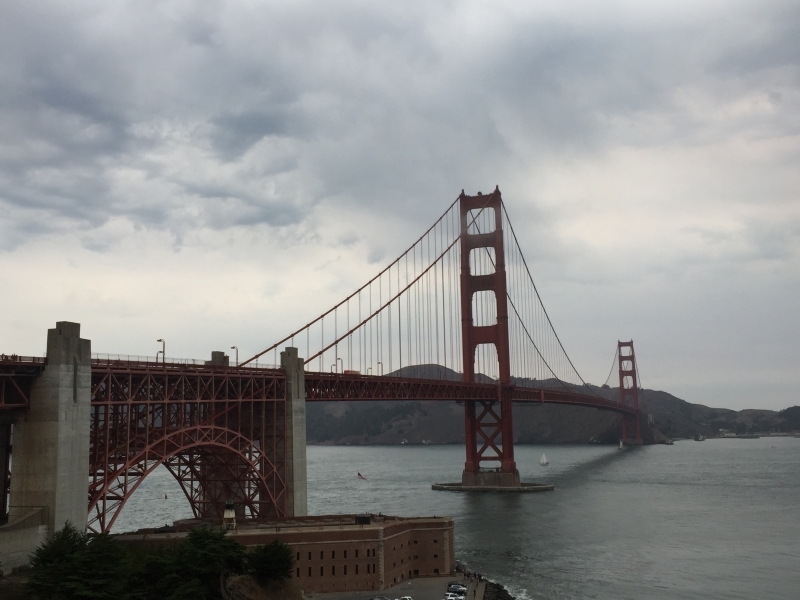 Still to come, blogs about the best eats along the trip and various accommodations from AirBNB to Hotels to stays at the roadside classic, Motel 6 (definitely a Guys Who Travel first).